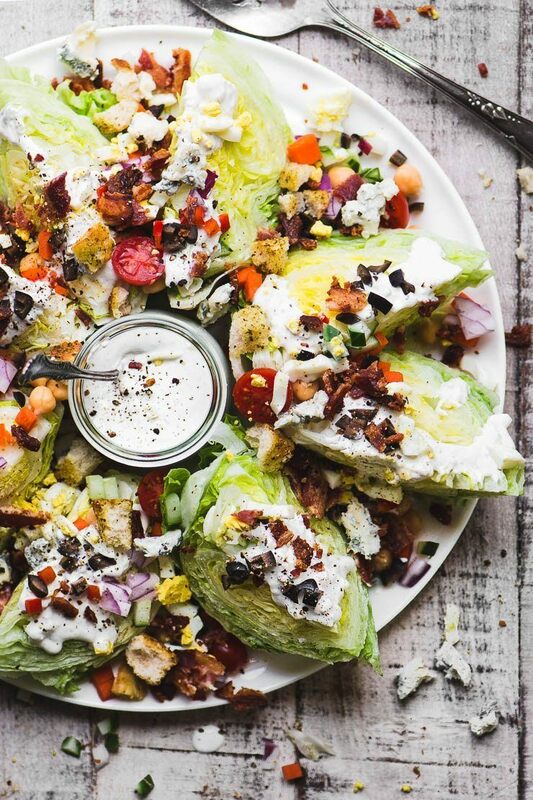 the Fully Loaded Wedge Salad is the Queen of salads ~ the salad even a salad hater can't resist, with hearts of iceberg lettuce piled high with goodies like bacon, eggs, croutons, black olives, creamy blue cheese dressing, and a few healthy veggies for good measure! Put the dressing ingredients together in a small food processor and process briefly until combined, but still lumpy. Add salt and fresh cracked black pepper to taste, and add more milk if you'd like a thinner dressing. Add more lemon juice if you like. Wash and dry your head of lettuce. Remove any loose or browned leaves. Slice the head in half, through the core. Slice each half into 3 wedges, so you have a total of 6 wedges. Remove any bit of core from the bottom of each wedge. Do this shortly before serving your salad, because the lettuce can start to turn brown once cut. Arrange your lettuce on a platter and drizzle each wedge with a little of the dressing. Scatter the toppings on top of the wedges and all around them. Serve immediately with extra dressing. Note: You can make individual salad plates instead of the platter if you like.